I have a feeling we can thank Sheldon Cooper and Sherlock Holmes (in all his variations) for the rise in fascinating and original male protagonists (or we can give Forrest Gump a hug). Despite who the credit goes to, these quirky male leads are highly entertaining and great characters to watch (and read). They’re the know-it-alls. The characters that don’t have the greatest social skills, but make some pretty excellent observations. They are peculiar and different. They are the unlikely heroes we love. 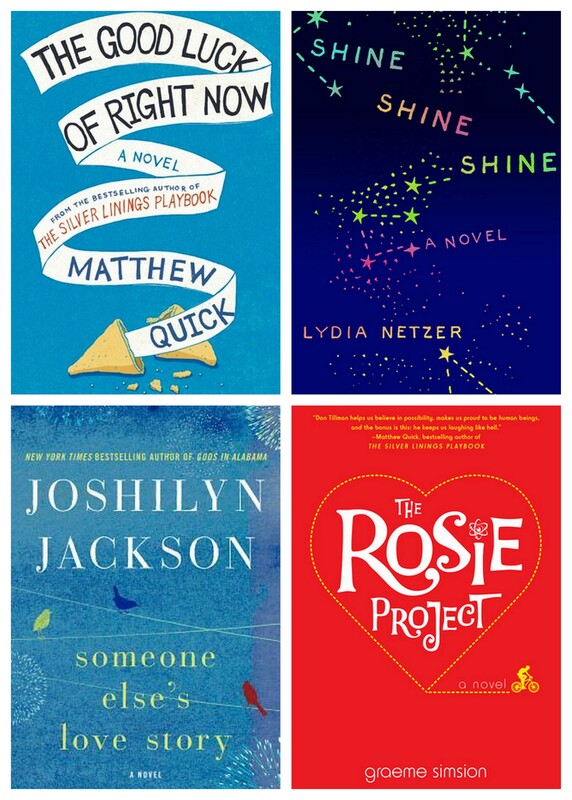 We have Don from The Rosie Project, Bartholomew from The Good Luck of Right Now, Maxon from Shine Shine Shine, William from Someone Else’s Love Story. All wonderful characters and none of them an Edward, a Jacob, a Peeta, a Gale. They’re original, funny, (sometimes) heartbreaking, and wonderful characters. Don Tillman is looking for a wife in The Rosie Project. So many laugh-out-loud funny moments with this one. Don has never been on a second date and it’s pretty obvious why not…he’s not one to shirk words or hold back his opinion. Bartholomew has just lost his mother in The Good Luck of Right Now. He’s never had a job or paid bills or had an “age-appropriate” friend, so he’s pretty lost. But he does know things have to change so he writes letters to Richard Gere while he tries to figure it all out. Along the way he takes a few chances (including talking to the “Girlbrarian” he’s had a crush on) and learns that he doesn’t have to go it alone now that his mom is gone. In Shine Shine Shine, the unconventional love story of Maxon and Sunny unfolds while exploring the age-old question of what is “normal”? Sunny was born hairless in Burma and is currently a lonely, pregnant stay-at-home mom, Maxon is a genius robotics engineer on a mission to the moon — so neither fit the traditional definition of normal. It’s a great story. Shandi thinks she’s found her very own Thor when William Ashe saves her and her little boy during a gas station robbery in Someone Else’s Love Story. William is in the middle of his own crisis when he meets Shandi and while I didn’t love this book, I did love William. His story was interesting and the parts that told his story were my favorite. Aside 1: Matthew Quick, the author of The Good Luck of Right Now does a great job of writing unconventional male characters — if you haven’t read The Silver-Linings Playbook, read it, too! (And if you like SLP, also grab The Revised Fundamentals of Caregiving. Like The Silver Linings Playbook, The Revised Fundamentals of Caregiving is about a man who has lost everything and both novels deal with the journeys the main characters take to rediscover themselves…their lives…and maybe their sanity. Aside 2: I hear I should also read The Art of Racing in the Rain and The Incident of the Dog in the Nighttime for more of the (peculiar?) characters I find so fascinating. Aside 3: If you’re in search of an actuary-by-day, superhero-by-night kind of guy, meet Chesney Anstruther from Matthew Hughes’ series To Hell and Back. The entire book is quirk. It’s got demons, televangelists, bad guys. Chesney definitely fits in with the guys mentioned above. The first book in the series is The Damned Busters. Aside 4: Who are the female counterparts in literature to these unconventional male characters? I’m really struggling to think of any…my first thought would be someone like Amy Dunne in Gone Girl but then all of the women I think of end up being unlikeable female characters (and obviously Sunny from Shine x3, but there have to be more) . The beauty of these male leads is that they’re likable and different. Thoughts? Who are your favorite unlikely heroes?